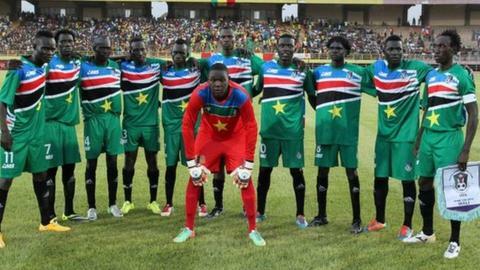 South Sudan's first World Cup qualifier is a "match for unity", said the head of the country's football association. The national team face Mauritania in the capital, Juba, on Wednesday in the first leg of their preliminary round tie. Having joined international football in 2012, a year after the country became independent from Sudan, the team is facing its biggest challenge. The match comes as South Sudan's civil war continues, despite a peace deal. FA President Chabur Goc Alei told the BBC that given the conflict the match was not just a sporting milestone for the country. "Today is really is a very big day for the whole country - all of the people are really excited," he said. "We call it 'the match for unity'... because when we are playing all the people they forget about the war, they forget about everything, they come as one nation, because sport in general and football in particular [is] uniting our nation now." More than two million people have been displaced by the conflict that begain in December 2013 and thousands have been killed. South Sudan go into the tie boosted by achieving their first competitive win on 5 September - beating Equatorial Guinea 1-0 in a 2017 Africa Cup of Nations qualifier. "We are ready, totally ready. We know what we have to do and we can spring a surprise," South Sudan captain Richard Justin Lado told Fifa's website. "Our coach Sung-Jea Lee has created a style of play that's based on defensive discipline and counter-attacking football, and I think we can cause some damage. We need to win, for many reasons, and we will win." However, Mauritania are ranked 55 places higher than their opponents and will be hoping to stamp their authority on the game and finish the job when they host the return leg on Tuesday 13 October. This is the first of two knockout rounds before a qualifying group stage, and five African nations will make it to the 2018 World Cup finals in Russia.